Software: NetEnt, Microgaming, NYX, Thunderkick, and Genesis Gaming. Games Available: Over 150 games, including: Video slots, Video poker, Blackjack, Roulette, and Classic slots. Cool Play Casino is a leading online UK NetEnt Casino operated by ProgressPlay Limited and licensed in Malta by the Malta Gaming Authority, and the UK Gambling Commission. Cool Play Casino games can be accessed from your mobile device or your desktop, giving players the freedom to play slots and games on-the-go or in the comfort of their own home. Players can expect to find hundreds of games from NetEnt, Microgaming, NYX, Thunderkick, and Genesis Gaming. 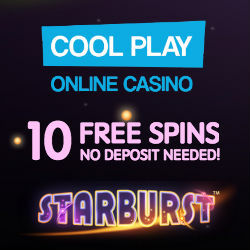 All new players at Cool Play Casino are eligible to pick up 10 Free Spins on Starburst for absolutely free. No Deposit is required! Simply sign up for a Cool Play Casino account to get your 10 Starburst Free Spins today. New players at Cool Play Casino can also get a Welcome bonus of 100% up to €/£/$200 by simply making a first deposit of €/£/$10. The wagering requirement for the Welcome bonus is 50 times. 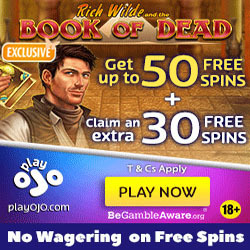 The wagering requirement for any free spins winnings is also 50 times. The maximum winnings for the No Deposit free spins is capped at €/£/$20. The minimum deposit is €/£/$10 for the Welcome bonus. The Welcome Deposit Bonus cannot be withdrawn as cash and can only be used to play the Games. You can withdraw any winnings after the wagering requirements have been met. The deposit options at Cool Play Casino are: Visa Electron, Visa Debit, Visa Delta, Visa, Mastercard, Maestro, iDeal, Trustly, Skrill, Neteller, Pay by Phone, Discover, JCB, Solo, Switch, Diners Club, and Paysafecard. You can deposit using the following currencies: EUR, GBP, and USD. Players residing in these countries may not play at Cool Play Casino: USA, Belgium, Belize, British Virgin Islands, Bulgaria, Croatia, Cyprus, Denmark, Estonia, Finland, France, Germany, Greece, Hungary, Ireland, Israel, Italy, Lithuania, Luxembourg, Portugal, Romania, Slovenia, Spain, and Turkey. For any queries, contact customer care via Email.